February 2019 Blog: Cold Bridging and how to avoid it! No, we're not talking about turning up on the 14th with box of chocolates and a dozen roses! Cold bridging is actually one of the primary causes of condensation. Condensation occurs when warm air touches a cold surface and, as the name suggests, condenses into water. This condition often encourages the growth of black mold; black mold prefers the clean water generated by lifestyle - that is cooking steam, baths, showers, etc. It is not difficult to see how this problem can take hold, an average person even breathes out a litre of water a day! What can be done to stop cold bridging? Again, Roses and chocolates will not help here! There are many variations on a theme but they basically boil down to ventilation or insulation. 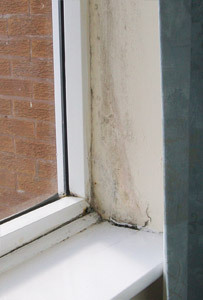 Ventilation will usually help with condensation issues but in a way it treats the symptoms rather than the cause. There are many products and systems that can help when looking at solving a problem like this. For example, humidistat fans are a modern and fairly inexpensive alternative to your standard bathroom and kitchen fans. The main difference is that the humidistat fan contains a sensor for reading humidity in a room and will switch on automatically when the humidity reaches a certain level. This can be very effective, particularly in the winter when you don't want windows open. Even a small bathroom can take 2 or 3 hours to clear of steam after a shower, so obviously the ten minutes on the old fashioned timed fans is woefully ineffective. A humidistat fan could mean that you can switch the light off and walk away knowing that the moisture is being dealt with, even if you are out of the house! There are a plethora of these on the market now, some even vent the room without losing the heat from the air. Another possible solution is a passive vent. Unlike traditional vents, which people used to selotape over to stop a gale blowing through the living room! Modern passive vents have insulation and one-way moisture membranes and use technology to encourage air movement without chilling the environment or losing too much heat. In short they are a modern, intelligent, virtually zero maintenance, alternative to old fashioned vents. A third fan assisted system which can work well, particularly for whole-house condensation issues, are positive pressure fans. These usually are sited near the top of a house, in the ceiling of the landing for example, and the small, low wattage fan runs at all times to slightly increase the air pressure inside the building. Don't worry it will not give you the bends or make your ears bleed! The increase in pressure is very slight, but just enough to keep pushing the air out of the building, very slowly. This constant movement of air can prove incredibly effective against condensation. We don't fit these ourselves, as it is simply electricians work, but we have heard of tremendous results from them! Insulation treats the root cause of condensation which is usually cold bridging. Very simply the insulation prevents the inner face of your wall from being a cold surface, so the moisture in the air doesn't condense when coming into contact with it. This can be proved scientifically by working out the dew point, etc. but it very basic terms, a cold wall is much more likely to suffer with condensation than a warm one! There are many, many ways of treating walls with insulation. For instance, insulated plasterboards are a great way to prevent a cold bridge without losing too much space. If you don't even have room for this, like for example around a window reveal where a thick board would encroach on the window frame, there are plasterable insulation boards available now. Products such as Warmup boards and Marmox to name but two. These can be anything from as little as 6mm in thickness and can be easily installed with drywall adhesive, mechanical fixings (with appropriate washers) or even a good quality fixing silicon if the substrate is appropriate. They can plastered directly too, so no other board is necessary. The double benefit of this type of board is that they are usually waterproof as well (check material specification for the board you want to use). They are usually used in wet rooms and this makes them ideal for treating areas where you are not sure whether you are treating a cold bridge or a damp bridge. There are also things to consider when undertaking new work, for example a new, insulated stud-wall can be insulated between the timbers. This is obvious, but what people rarely consider is insulating behind the stud-wall first! 25mm of insulation behind a stud wall will prevent most of the cold bridging through the timbers. Alternatively you could use insulated plasterboards on the front of the stud, but this tends to be more expensive and time consuming, and you only end up with the same result. If laying a new floor slab or a section of a new slab, it is fairly unthinkable to forgo insulation underneath the slab now, but we still see many projects where no insulation has been inserted around the edges of the concrete to stop cold bridging from the old walls. If you have actual penetrating damp or rising damp as well as a cold bridging or condensation problem then a cavity drain system may go a long way towards ticking all of the boxes if the substrate is appropriate... Hope some of these ideas help! Thanks for reading.